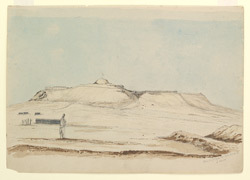 Pencil and water-colour drawing of the fortress by Thomas Studdert (1812-1855) in 1842. The fortress of Kalat-i-Ghilzai in Afghanistan is situated on an isolated rocky outcrop 5543 feet above sea-level and 200 feet above the surrounding plain. It lies on the right bank of the river Tarnak near the road between Kabul and Kandahar. In the First Afghan War a British garrison, under Captain Craigie of the 43rd Bengal Light Infantry, was held under seige at the fort by the Ghilzais and cut off from the rest of the army for six months. The British garrison was finally relieved by a brigade of troops from Kandahar in May 1842.